MB attended a night out with work colleagues last night at the La Cigale Hotel in Doha. The event comprised a sit-down dinner and musical performances by two well-known Lebanese male singers. A few shots from the hotel and the event follows, and there’s a short video clip of one of the performers at the end. To convert the drink menu prices into Euro, divide by 4. Pricy! The Food. OMG. The Food. The modern lifestyle of many Middle East Arabs is far from healthy. 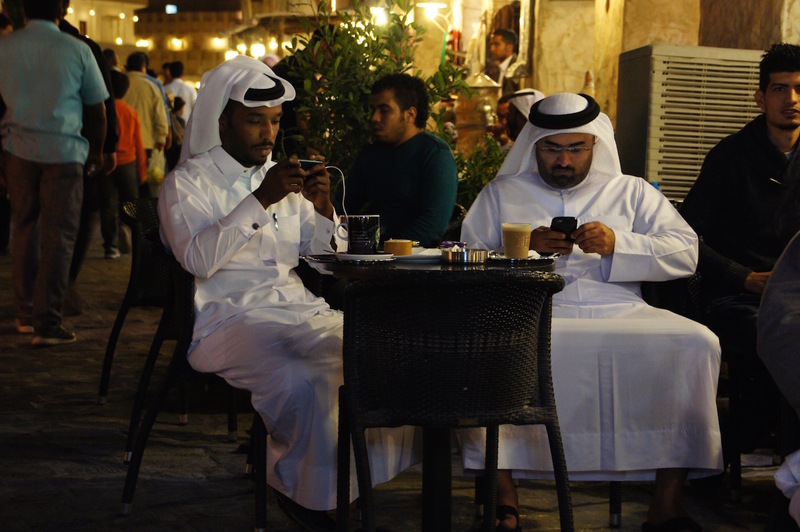 Night time can often involve hanging out in cafes or restaurants to watch a televised football match while smoking flavoured shisha. There is a misconception among many that because the smoke is forced through the water pipe that it is somehow less toxic. But research shows that the sweet smelling smoke is even more harmful that normal cigarette smoke. Cigarette smoking itself is also far more extensive than back in MB’s homeland. The historic activity of nomadic desert migration is long since replaced by the wandering from the Baskin & Robbins oasis to McDonald’s to Dunkin Donut and others in search of the nightly fix. Very often the Arab driver will honk the car horn outside the restaurant of choice and the restaurant workers will rush out to take the order. They will return again minutes later with the high carb food, ensuring that Mohammad didn’t even have to take the short walk from car to counter before he wolfed it down. The climate of course isn’t conducive to physical activity for much of the year. But there are at least 5 to 6 months when the weather is excellent for an evening stroll or jog, or any other kind of sporting activity you care to mention. There is no historical culture of sport however, so participation levels by locals are very low, as much as MB has observed. The Dubai marathon each year for example, has thousands of participants, but native numbers are lamentably poor, despite the best efforts of the Government to encourage local participation. The present nightly summer temps are in the mid thirties but the only joggers that MB sees on his nightly outings are fellow Westies. Eating habits are also a cause of concern. The month of fasting from sunrise to sunset that is called Ramadan actually witnesses many Arabs gaining weight, as they gorge themselves at the evening ‘Iftar’ meal and the body is just unable to burn off the calories consumed during the following very shortened working day of that month. Eating to excess is commonplace even throughout the remainder of the year, as the traditional evening meal involves many and varied starters which must each be sampled, followed by large plates of meat and rice with various yoghurts, and a desert course. Then a creamy mocha or cappuccino to wash it all down following by the obligatory puffing of the hooka pipe. The incidence of diabetes, for all the above reasons, has risen dramatically in recent years and regional health authorities speak of a diabetes epidemic in the coming years. All in all, many similarities with many western countries as you can see! Today’s Bread. 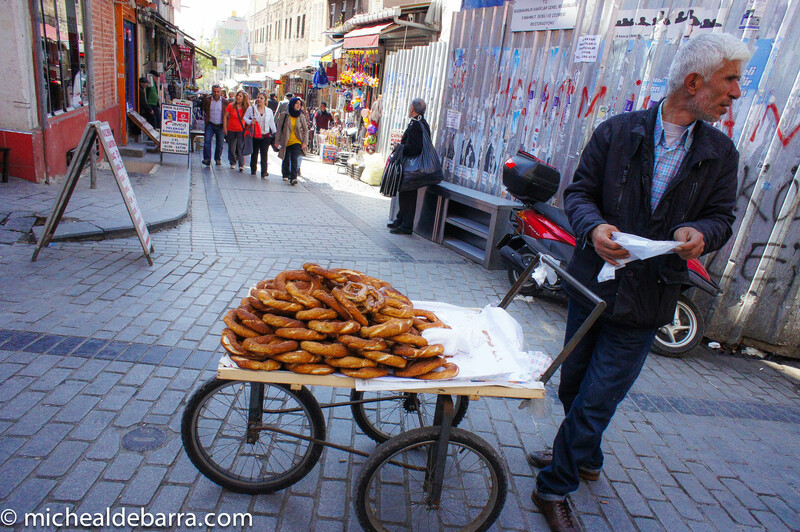 Sellers of this delicious street bread abound throughout Istanbul. When it comes to food (or anything else), never under-estimate the Turks! They are the food wizards of the world. The entire population should be called Merlin. The recent trip to Istanbul has left MB with many tasty tastes long lingering in the mouth. And some extra inches on the waistline. Will return to the Istanbul food topic another time. 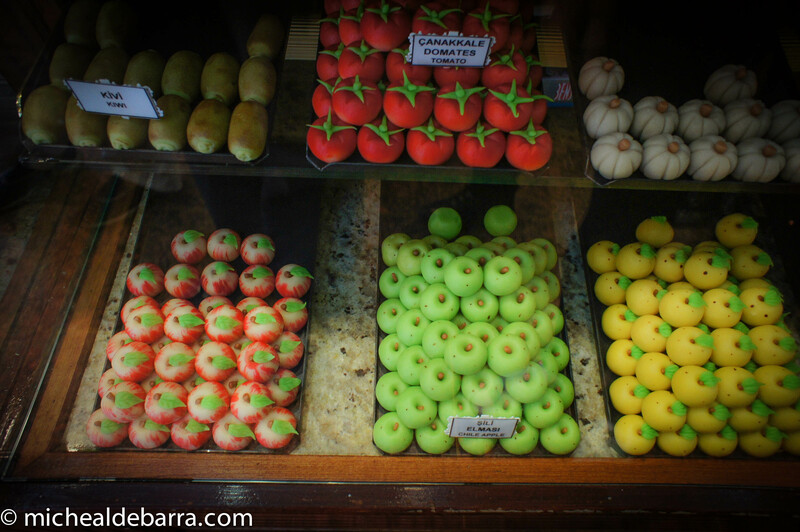 But for the moment, and on the theme of sugar – MB gives you a shot of some fruits (from an Istanbul food shop) made entirely from marzipan (which has sugar ingredient). And get this. Those crafty Turks have added some magical flavourings that make them taste exactly like their real fruit cousins! 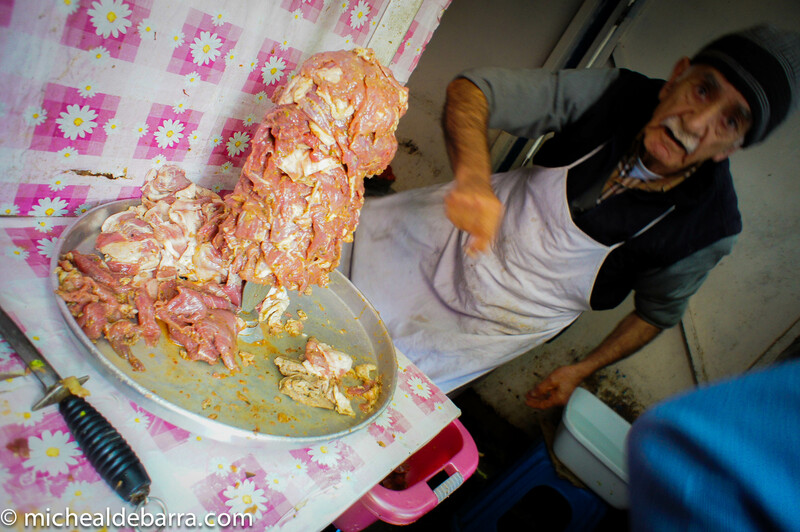 This guy makes kebabs early morning with real cuts of meat & spices in a small back-street shop. He sells to various kebab sellers around Istanbul.